secondary income (transfers) deficit increased 70 billion yen to 125 billion yen. 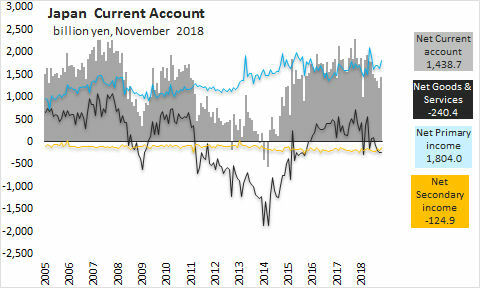 As a result, the current account surplus increased 227 billion yen to 1,439 billion yen over October 2018. As a result, net international goods trade deficit decreased 35 billion yen to 176 billion yen, over October 2018. 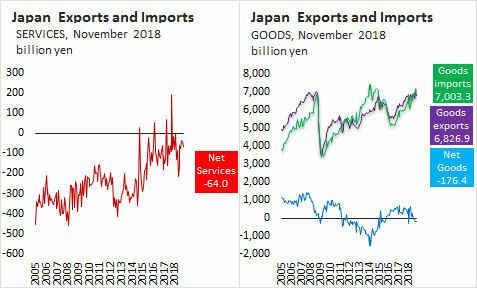 Net international services trade deficit decreased 21 billion yen to 64 billion yen, over October 2018. 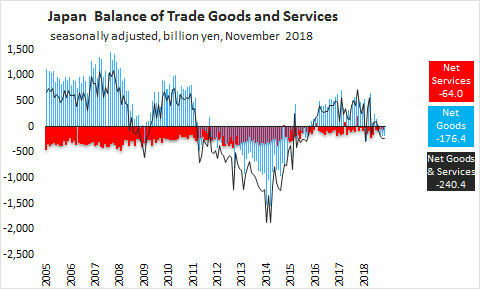 As a result, Net international trade (goods and services) deficit decreased 4 billion yen to 240 billion yen, over October 2018.